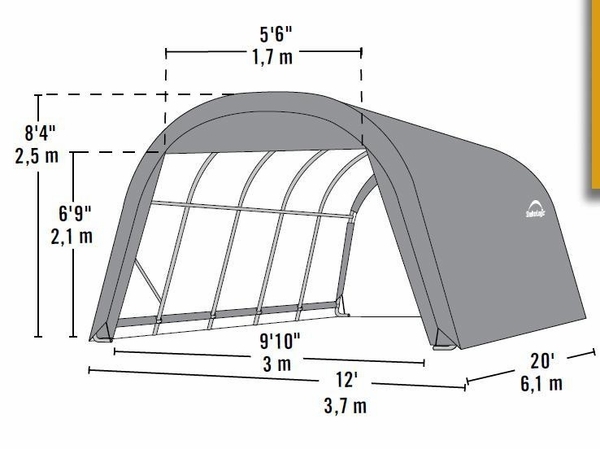 The Shelter Logic 12 x 20 x 8 Round Portable Garage Canopy - Green has been field-testing and can withstand all but the severest weather conditions. The steel frame is bonded with DuPont thermoset baked on powder coating to eliminate the possibility of rust, peeling, chipping and fading. Assembly is a snap with swedged tubing and slip fit connectors. 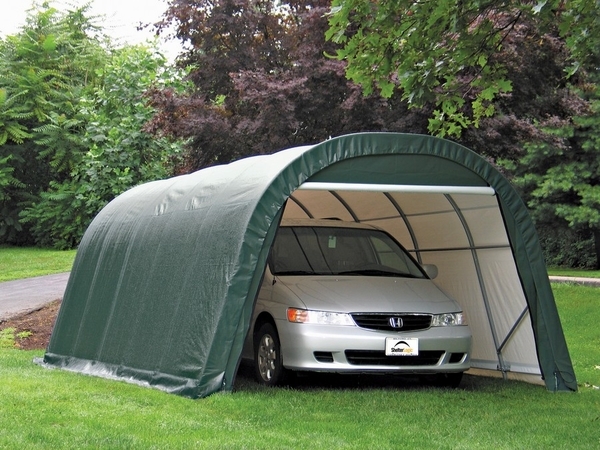 Shelter Logic 12 x 20 x 8 Round Portable Garage Canopy - Green has foot pads at every leg giving a sturdy base. It is manufactured by Shelter Logic and has a one year warranty. Does this product come with roll up garage door? This product does indeed come with a door. It is great! My Van fits in it perfect. Mty son put it up for me in just a few hours. His wife helped by holding the pipes. ProsIt will keep the frost off my windows. Good product at a fair price. The only thing I had to do was drill a few holes in the correct place to assemble. It was impossible to connect all the metal pipes using their "off-center" pre-drilled holes. I was able to assemble this by myself completely but I recommend having a second person for some of it, I could have done it in half the time. I dropped a second tarp over it also to give a second layer of protection from falling tree branches on my property. I would recommend buying this product from this store, I was happy with all aspects of my purchase!!!! Mike on Martha's Vineyard. Fast shipment, assembly was easy.